In Pennsylvania, the Gerrymander of the Decade? There have been a lot of good candidates for the "gerrymander of the decade" award this cycle. North Carolina, Illinois and Texas have all dreamed up district lines that have gone well beyond what many pundits believed could be pulled off in those states. Honorable mentions go to Massachusetts and Maryland, whose districts combine to allow for the election of one Republican out of 17 districts. But the legislators in all those states were making heavily Democratic/Republican delegations in states that were likewise heavily Democratic/Republican. That isn’t a tremendous job. Republicans in Pennsylvania, however, took a state that is two or three points more Democratic than the country as a whole, and created 12 districts (out of 18) that are more Republican than the country as a whole. They did so by creating what can only be called a group of Rorschach-inkblot districts in southeastern Pennsylvania. The net result is a map that shores up their vulnerable incumbents, and that may well result in a 14-4 Republican edge by the end of the decade. To see how this works, take a look at the following two charts. The first one shows the 2008 Obama percentage in each district under the old lines and the new lines, as well as the change (negative is toward McCain, positive is toward Obama). A few quick notes: The new 4th district is just a renumbered version of the old 19th district, while Democrats Mark Critz and Jason Altmire were placed together in the new 12th district. Also, the new district percentages were compiled using Dave’s Redistricting Application; it doesn’t allow for precinct-splitting, so some of these numbers may be off by a 10th of a point or so. So the basic idea that guided Republicans was this: Take the five extremely vulnerable Republicans, and push them all into Republican-leaning districts (with the exception of Michael Fitzpatrick, whose district becomes only a point or so more Republican due to geographic constraints). 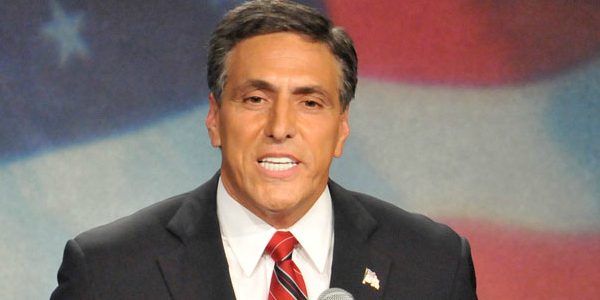 In particular, the district of Republican Lou Barletta (pictured) goes from a 57.5 percent Obama district to a 47.7 percent Obama district. Jim Gerlach’s district went from 58.4 percent Obama -- barely winnable for Republicans -- to 53.4 percent Obama. To make this possible, Republicans merged two Republican-leaning districts where Democrats had nevertheless managed to win in the good Republican year of 2010, and they then turned Blue Dog Democrat Tim Holden’s district into a solidly Democratic one. They also removed Democrat Allyson Schwartz’s district from the “potentially competitive” category -- but in the long run, this map probably improves it Republican performance. While it is difficult to project out over the course of a decade, the Republican map does three important things: First, it moves the Democratic areas of the 6th and 7th districts from the inner suburbs of Philadelphia to blue-collar areas around Reading and Harrisburg. In other words, the Democratic areas of these districts are now in places that have been trending Republican slowly, rather than in places that have been trending Democratic slowly. This limits the potential for a “dummymander,” where redistricting backfires as districts shift over the course of the decade. Second, it places Democrats Critz and Altmire together in a Republican-leaning district. It is mostly Altmire’s old district. But Republicans again removed inner suburbs, this time around Pittsburgh, and added white working-class areas like Johnstown, while keeping Republican-trending areas like Beaver County in the district. In the long run, this district will probably trend Republican as well. Third, Republicans made Holden’s district more Democratic, but again, did so by adding blue-collar areas around Wilkes-Barre and Scranton. In the short-run, the Democratic tilt of the district makes Holden more vulnerable to a primary from a more liberal Democrat, but in the long run, there is a risk that the district would shift more toward Republicans than Democrats. Taken together, this is a district that probably accomplishes Republicans’ goals: It maintains solid Republican majorities in all but the worst Republican years, while maintaining the potential for further Republican gains. It’s probably the most effective gerrymander we’ve seen so far.